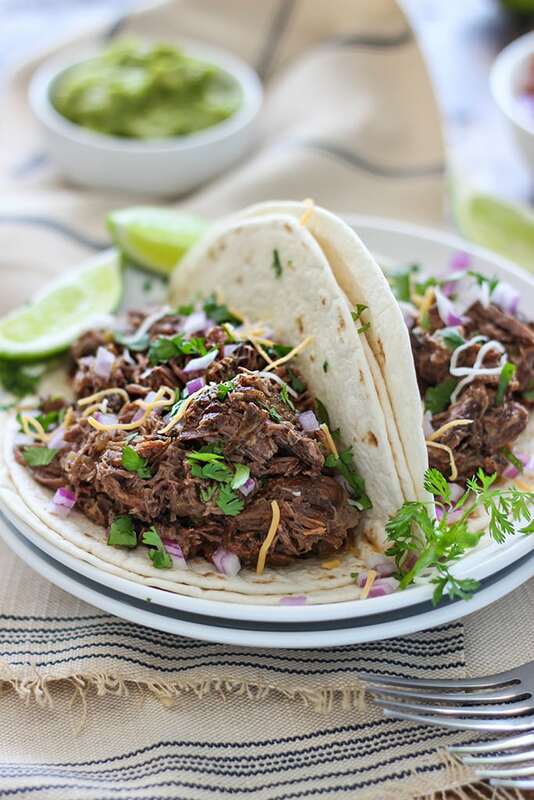 These slow cooker shredded beef tacos are summer slow cooking at its best! 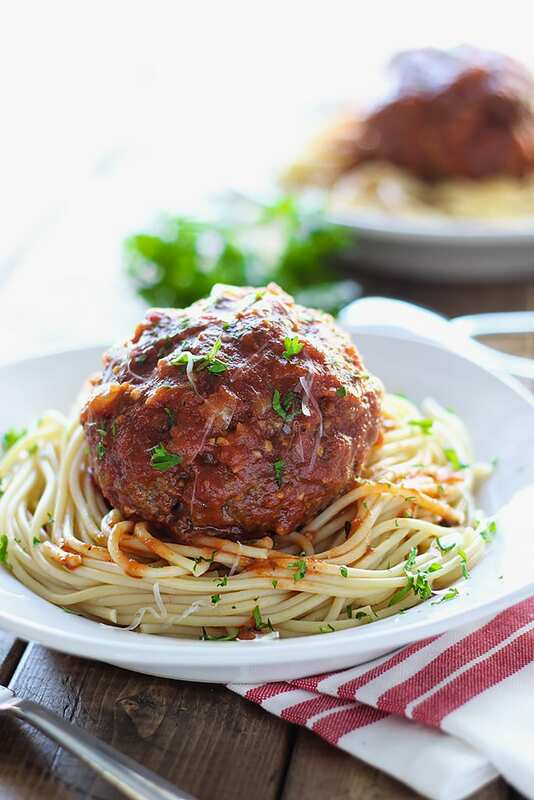 Pair it with your favorite toppings for a hands-free, fun, family and friends meal! 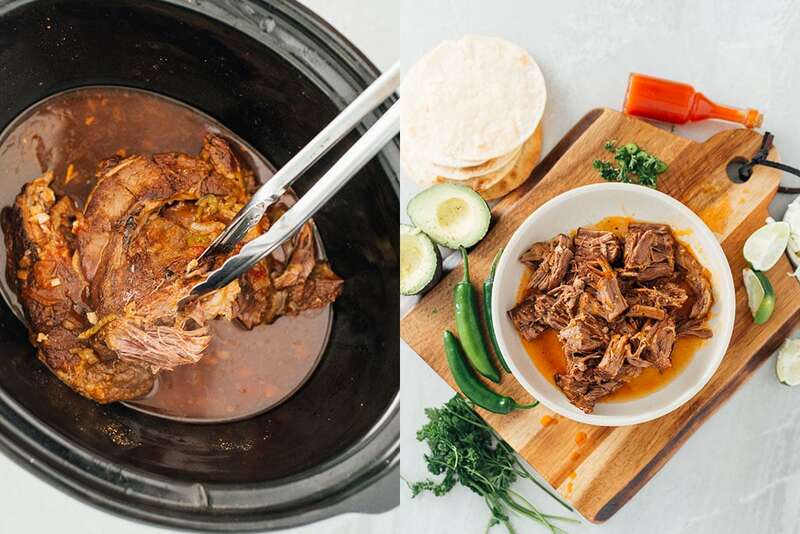 How about some summer slow cooking? We want something easy and hassle free but good enough to feed a crowd or a family for a couple of days. 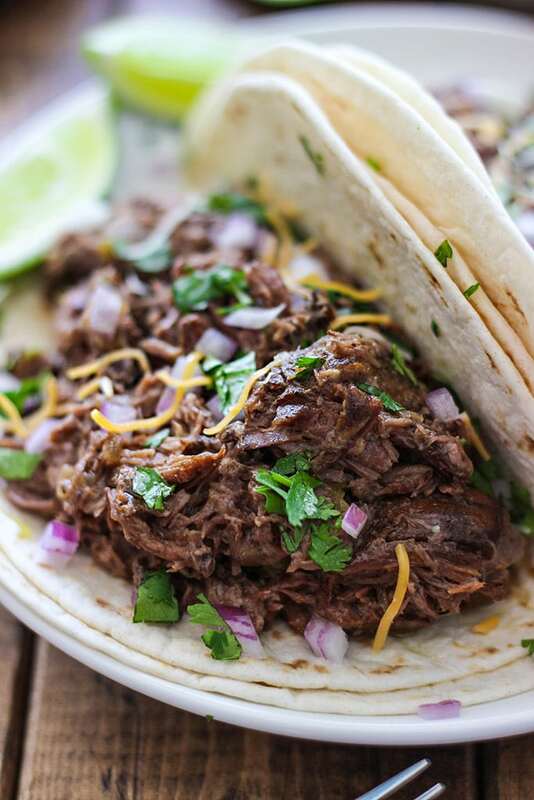 So today we’re gonna be doing some slow cooker shredded beef tacos with some chuck roast seared lovingly before it’s slow cooked for hours in a spiced tomato sauce. The toppings are entirely up to you. Lettuce, cheese, beans, rice, tomatoes, onions, cilantro, lime, guacamole, salsa, sour cream or hot sauce Maybe even some corn! And don’t be limited by the title of the recipe. You can use this beef for burritos or enchiladas too. There’s some cayenne and jalapeno in here, but when all was said and done, I didn’t find it spicy at all so don’t be turned off by those two. And if you want it super spicy, just add in more peppers or cayenne. Or some hot sauce. We always have a bottle of Cholula handy at home for this. Use a cheap cut of beef for this, something perfect for slow cooking like a chuck roast. I seasoned it with salt and pepper and seared it for awhile cause searing before braising is good. You can skip this step if you don’t want an extra pan to wash but read this before you do so you can make an informed decision! Then in the slow cooker it goes and you top it with the diced onions and sauce mixture, which is beef broth spiced with cayenne, ground cumin, smoked paprika, garlic, tomato pasta, lime juice and diced jalapenos. If you want less heat, remove the seeds from the jalapenos. I did this, so my beef wasn’t too spicy. If you want more heat, leave the seeds in. If you want even more, add more peppers or more cayenne. It’ll look like a slab of beef with very little juices to go around before you start cooking. Don’t worry about this because after 8 hours of braising, the beef will break down you’ll end up with more than enough juices to coat your shredded beef. Slow cook for 6-8 hours on low or 3-4 hours on high and that’s it! I did mine on low for 8 hours. Then serve with your favorite toppings and enjoy! Hi Farah! I don’t use my crockpot as much as I did when I was working, but I recently brought it back out. This recipe is perfect! I cook every day (as I’ve always done), but sometimes it is nice to load up the crockpot and when suppertime rolls around it’s all ready! 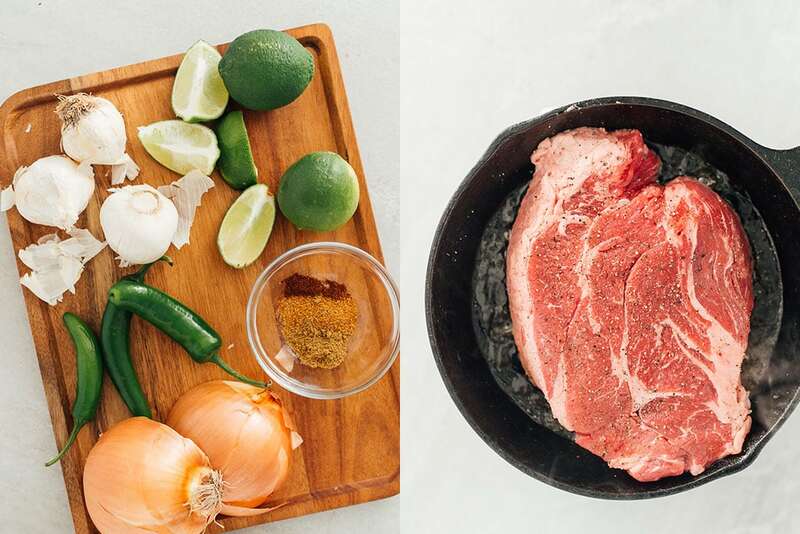 I agree with you on searing the meat first – it’s such a simple step, but makes a big difference in flavor in my opinion. It’s something I just got used to doing along the way. Plus I really like the smell of seared meat, smells so good! I cooked this last night and everyone loved it….will be making this again. Great and easy to make. We enjoy all your recipes. Looks delish! I am such a taco person! 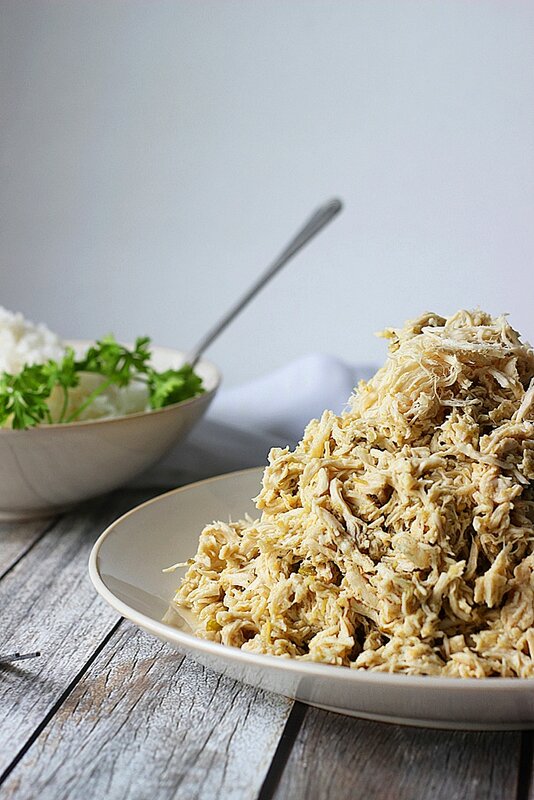 Would you cook chicken for the same hours as beef in a slow cooker if I were to make shredded chicken tacos? Thanks! Yes, I would. I did another slow cooker Mexican-inspired chicken dish here. Same cooking time but I would advise not to go over that as chicken gets very, very tough if overcooked. Happy eating! Gosh, I wish I knew more about a smoker. I did some research and they said chuck roast works well with it, so the only thing I would change is not to use the beef broth and make it a rub of sorts. The cooking and timing I leave to you and your experience! Other than that, I should think it would work! Anything you want to know about smoking just ask. One day I just might! Thank you for the recipe! We made this yesterday and it was great, delicious! Can I use lemon instead if lime? You could if you prefer the taste. Although it will taste a little different! I just made this in the pressure cooker. Cut the beef into large chunks and cooked for about 20 minutes. Pretty good! Pressure cooking is like cheating with food. I love using it with lamb and lentils. All it takes is 20 minutes! 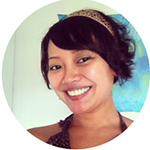 Dang Girl…. this is good stuff. The only thing Idid different was I grilled the meat on a searing station…. on my grill. It’s all good! Hey, I’m glad it worked out for you Bill! This one seems to be popular with the menfolk with all their talk of smoking and grilling. You’re welcome, Garry! 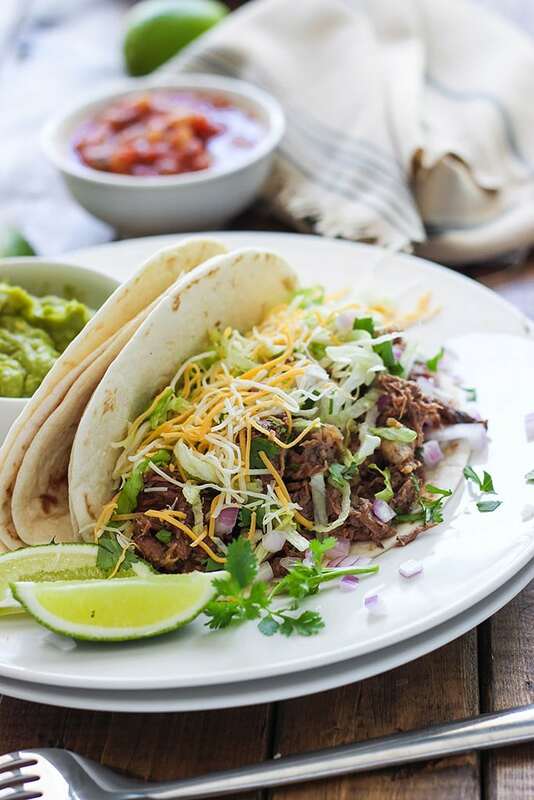 It’s versatile enough to be put into many things, not just tacos. Burritos, quesadillas, enchiladas, you name it. Fantastic recipe! 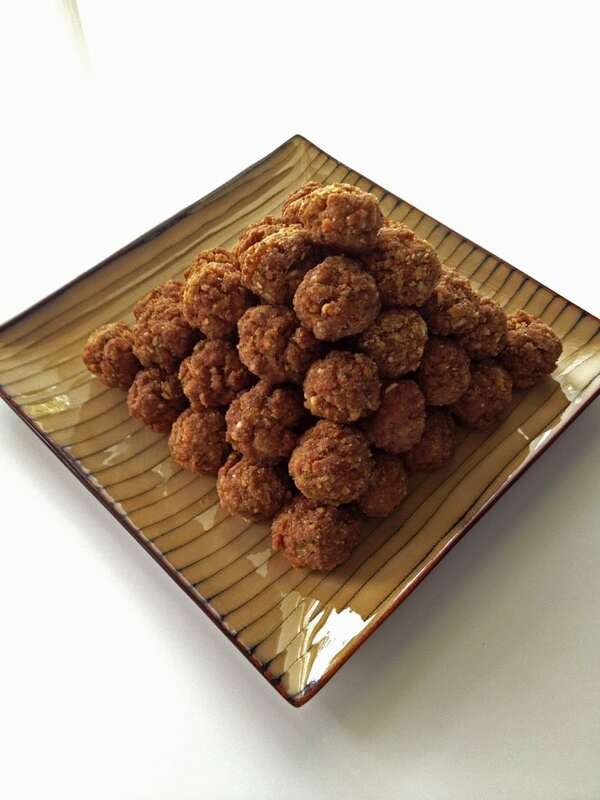 I even shared the recipe with my grandmother and all of her guests raved about the meal! My cousins wife after dinner asked for the recipe as well! Thank You! Wow, that’s GREAT to hear! Grandma approved! 🙂 Thanks for sharing the recipe with your family and letting me know it was a hit! Crock pot has been going for about 3 hours now, I wish they made air fresheners in this scent! I can’t wait to eat it! This recipe is fantastic!! Not only have I shared it multiple times but it’s been in regular monthly rotation in our household. If you’ll permit me to share a sauce for this – while searching for meals for my family I came across a blog called damndelicious and there’s a burrito bowl recipe that has a chipotle cream sauce. 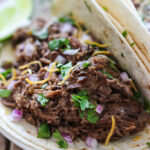 I use that sauce recipe as a topping on these shredded beef tacos and it’s an AMAZING addition! They go perfectly together. Then, with the leftovers, I lightly add the sauce to some tortillas, add cheese, and your shredded beef recipe and make quesadillas! It’s a hit with everyone! Thanks so much! Most welcome, Joshua. Thanks for sharing the recipe with people! That sauce looks like a wonderful way to spice up regular sour cream: sour cream, chipotle, lime and garlic! My favorite taco recipe nailed !!!! I don’t even bother going out for tacos anymore cause this recipe is THE BEST !!!! Serve with corn tortillas cilantro onion and lime !!! MMmmmmm make this once every couple weeks at least. !! Yay!!! Glad you’ve found a staple, Melissa. Enjoy the tacos!